FOR IMMEDIATE RELEASE – New Brunswick, NJ’s alternative rock trio Lost Romance has been asked to perform once again at this year’s Light Of Day Benefit 2014. This year’s performance will take place at The Saint in Asbury Park, NJ on Saturday, January 18th, 2014. LR will kick off a night of rock at the legendary venue that is part of a 4 day event to benefit Light Of Day Foundation. 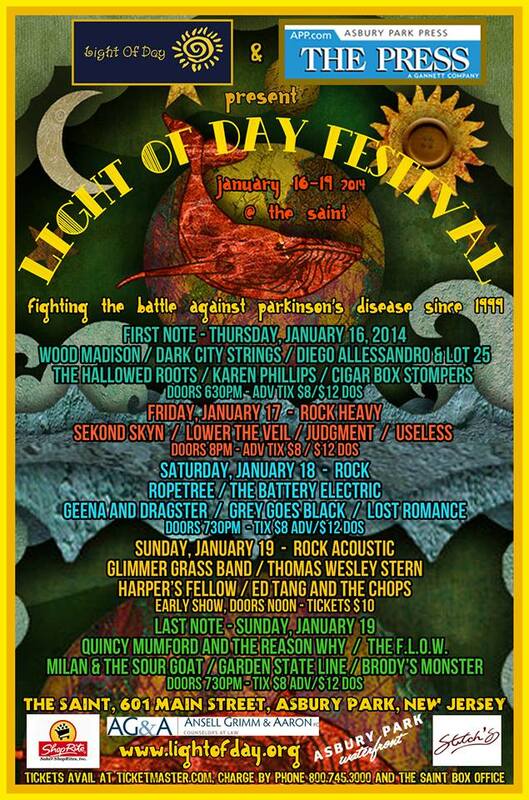 Now in it’s 14th year, Light Of Day puts the spotlight on the Asbury Park music scene while raising money to help find a cure for Parkinson’s Disease. In years past, Light Of Day Benefits have included performances by rock luminaries such as Johnny Rzeznik (Goo Goo Dolls), Ed Kowalczyk (Live), Willie Nile, Joe Grushecky, Jesse Malin, Pat DiNizio (The Smithereens) Pete Yorn, Nicole Atkins, Darlene Love and The Boss himself, Bruce Springsteen. Hot off their recent Northeast tour in support of their new EP “The Light And The Dark”, this show marks their first show of 2014. Joining them on this show will be local Asbury Park rockers, Ropetree, The Battery Electric, Geena & Dragster, Grey Goes Black.